Japanese Episode DP 167: "The Pokemon Beach School!" American Episode 1310: "Teaching the Student Teacher!" 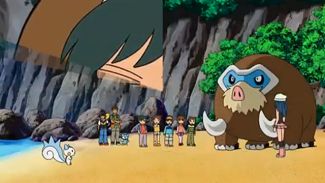 At a beach on the path to Risshi Lake, Satoshi and his friends meet up with Hikari's mother. She's came to the area to teach a special class on pokemon, but she won't be able to attend! Ayako has to fill in for one of the judges at a nearby Pokemon Contest, so Hikari and her friends volunteer to teach the class in her place. The next day, the young Pokemon Trainers gather at the beach and address their class of five children. In the morning, they try out various activities, such as teaching them how to tell if a pokemon is healthy and how to throw a Monster Ball. In the second half of the day, Hikari decides to show off a new combination she had been working on. The idea behind this "Ice Chandelier," she explains, is to encase her Pachirisu in ice before having it launch an electric attack that will shine brightly. One of her attempts, using Mammoo and Pachirisu, fails when a dizzy Pachirisu falls over. Later, Hikari decides to swap out her Mammoo with her Mimirol and try again. The smaller pokemon's Ice Beam eliminates the necessity for Pachirisu to spin around, enabling it to successfully pull off the combination. After the class is over, Ayako meets up with her daughter again and tells everyone that Candy Musalina won the Pokemon Contest that she was judging. She then gives Hikari a new dress to use for the Grand Festival and wishes her daughter luck on her battles ahead. I see this episode as a compliment to the last two episodes. When Satoshi was in Nagisa City, he was running around with a bunch of adults (Ohba is at least twice his age!) who had all these experiences that Satoshi didn't. Well, that, and the fact that Satoshi was a lot shorter than everyone. Anyway, the gap between Satoshi's skill level and that of his opponents was quite apparent. In this episode, however, we get a bit of a role reversal. 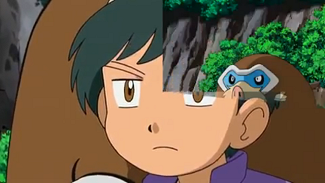 Here, Satoshi is the experienced trainer, not just some newbie little kid. Whenever Takumi teases his teachers or starts causing trouble, it's up to Satoshi and his friends to be adults about the whole thing and deal with it. I feel like part of the reason this episode exists, other than for all the Contest stuff, is to show us that even though Satoshi isn't quite at the level of, say, a member of the Four Heavenly Emperors, he still has enough experience to be in charge of a bunch of human beings half his age. Speaking of Contest stuff, I love how Hikari pretty much hogged the entire afternoon with her Ice Chandelier practice. Ayako's lesson plan must have had something like "1:00pm - 3:00pm - Force students to watch me train" scribbled on it, because that's pretty much exactly what Hikari did. We've all had those teachers at one point or another who obviously didn't have anything planned for the day and would just pop in a random movie instead. Hikari reminds me of one such teacher. Here, she apparently didn't feel like teaching the kids anything they could actually use themselves, so she engaged in a self-serving training session instead. Oh, and Candy Musalina won her fourth Contest Ribbon! I wish more screentime had been given to that instead of, say, a little boy chasing around a penguin with a marker, but still! I remember being excited when she got this Ribbon because at this point, there was no doubt that Candy Musalina was going to make it all the way to the Grand Festival. You don't give Musashi four Ribbons and then not let her get into the Grand Festival, right? I wish we had actually seen Habunake win a Ribbon for its master, but there's really nothing we can do about it. I also love how Ayako randomly gave Takeshi a box of sweets at the end of the episode. There was no reason for it at all; she just gave him a box of sweets. And then gave her daughter a dress. And then gave Satoshi nothing. The difference between the way bratty kids act in America and the way they act in Japan is showcased quite well in this episode. Takumi is an insubordinate bully in the Japanese version, but Thomas seems to have kicked that up a few notches. His insults are delivered in a much nastier tone of voice, and things he says are just a teensy bit more rude than what Takumi says is in the Japanese version. I don't know if I can blame him, though; if I was a five or six year old kid who sounded like someone twice my age, I'd probably act like a douche as well. Crab keeps its Japanese voice. We can't even get a full minute into the episode without something to point out! Brock: "It's nice to see you again, Johanna." Takeshi doesn't call Ayako by name in the Japanese version; instead, he calls her Hikari no Mama-san ("Hikari's Mama-san"). It's weird, yes, but that's just how they do it in the Japanese version. Orchid-Hakase refers to Hanako as Satoshi no Mama-san ("Satoshi's Mama-san"), so it's not like Takeshi is the only character to refer to someone's mother in this extremely baffling way. I grew up in the South, and I was always taught that you never refer to adults by their first name unless you're given permission. You either refer to them as Mr. or M(r)s. Family Name (which I realize doesn't really apply to Dawn), use "ma'am" or "sir," or construct your sentences in ways that avoid references to the person's name. If I had done what Brock does in this episode as a kid, I'd have been told off for being rude. You just don't do what Brock does in this episode. 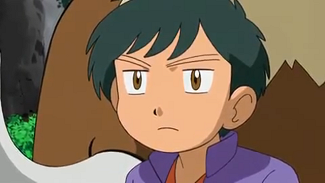 And doesn't Brock refer to Ash's mom as "Ms. Ketchum?" 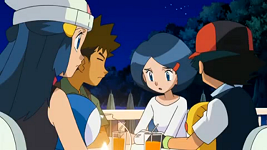 Again, I know that Dawn's never been given a last name, but it does strike me as funny that Brock is respectful to Ash's mom but is totally casual with Dawn's. The name of the class that Ayako traveled across Shin'ou to teach is Hajimete no Pokemon Koodineetaa Sukuuru (初めてのポケモンコーディネータースクール), or "My First Pokemon Coordinator School." In the dub, the class is called "My Very First Pokémon Coordinator Class." Thomas: "You've gotta admit, Piplup, your face looks a whole lot better now! During this scene in the Japanese version, Takumi's mostly just laughing. TPCI very rarely adds dialogue where there wasn't any, so seeing them do this here is quite unusual. Dawn: "Brock has to be the greatest chef in the world!" I'm not sure "chef" is a word you'd use for someone who makes crust-less cheese and egg sandwiches that look like they were bought from a convenience store. I think a better translation of Hikari's line in the Japanese version, Takeshi no ryouri wa sekai ichi na no! (タ ケシの料理は世界一なの！) would have been something like "I think Brock makes the greatest food in the world!" I know it's super nitpicky, but it still bugged me. Dawn: "I call this "Flame Ice," cuz it's a flame in ice!" There's an actual reason why Dawn is delivering such a redundant line here. It's because originally, Hikari is explaining the meaning of the combination to which she gave a foreign name. The original Japanese lines are Ko'ori de hono'o o tsutsumi komu. Kore wa Fureemu Aisu yo! (氷で炎を包み込む。これはフレームアイスよ！). This can be translated as "The ko'ori ("ice") wraps around the hono'o ("flame"), so I call it "Flame Ice!" The meaning of the English phrase "Flame Ice" might not be immediately apparent to this group of five Japanese kids, so Hikari's explaining the name in terms (in this case, Japanese) that they'll understand. The only way this could have worked in the English dub is if they had given the combination move "Flame Ice" some foreign, non-English name. Something like "I call this "Llama hielo," cuz it's a flame in ice!" (Except maybe they'd use a term that wasn't translated from Google Translate). Since they didn't, however, they really had no choice but to make Dawn be Captain Obvious here. One explanation I wish we got from this episode is why the hell "Ice Chandelier" is called "Ice Chandelier." Isn't one of the things people think about when they think of chandeliers is how they hang from ceilings, something that Pachirisu's and Mimirol's combination doesn't incorporate at all? A scene transition got cut, most likely due to the way Cartoon Network places its commercial breaks. This particular cut stands out because that one shot of Takumi is completely removed from the dub. Normally, they only cut the actual transition but leave everything else alone, but in this case, they removed the entire zoom-in shot of Takumi's face as well. They do it again! Ack! Ash: "How was the Neighborly Town Contest, Johanna?" In this case, Satoshi avoids addressing Ayako by name by simply asking "How was the Pokemon Contest?"